The Monkeys: Delilah's Gotcha Day! Today is my 3-year Gotcha Day! Thank you, Ann from Zoolatry for the beautiful graphic! I am so happy I found my Mommy and I am pretty sure she's happy she found me! I was so hungry, wandering around all alone outside. This place is warm, loving and there's all the food I can eat. We're a very happy family when you add Samson and The Ball Guy coming over sometimes to play fetch with me. My life is beautiful! Samson used his allowance and got me this cool incline scratcher! So far none of us have used it as an actual scratcher (except Mommy when she was showing us how it's used) but the ball in it is very fun to bat around. Samson, the lazy one, discovered that it makes a great nap place. Today is also the first time I get to celebrate my Gotcha Day with all my wonderful friends in the Cat Blogosphere! To get the party started, we have plenty of treats, toys and nip to go around. To make things even more exciting, we won a contest over at Baby Patches' blog! We won a container of Cat-Man-Doo Dried Bonito Flakes! We're so excited because they look so yummy! Samson and I are both big fans of fishy flavors. My wish is that all the kitties that have not been gotcha'd, will hit the jackpot like I did, so I'm going to make a donation this week to a cat charity (I haven't decided which one yet) to help my dream come true. I've been saving my allowance so I'll let you all know which one I decide on later this week. Thank you all for visiting me and I hope you have a wonderful day! You are one lovely ladycat! I'm honored to be able to follow you and your brothers antics! Hurray for your Gotcha Day Delilah! We'd like to join in the party because we have Gotcha Days too! Congrats on winning the contest also. And you're so lucky, not only to have a wonderful Forever Home, but because you have such a generous brother to get you that cool scratcher! Enjoy your special day!! Happy happy happy happy happy happy Gotcha Day! Happy Gotcha Day, Delilah! We're so glad you got gotted! And congrats on winning Baby Patches contest! What a great way to celebrate your special day! 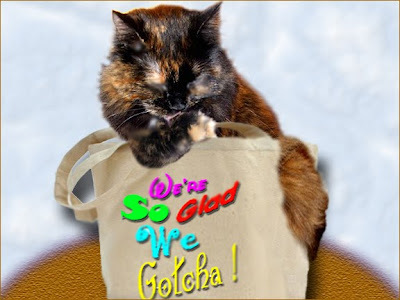 Alla' us have been gotcha'd too and we know how im-purr-tent it is, too. So, we want you to know that we celebrate with you and hope that many and many more kitties and puppies get gotcha'd soon. happy gotcha day Delilah! I'm so glad you has a wonderful furever home. Delilah, I'm so glad you got gotted by your Mommy and found your forever home. HAPPY, HAPPY Gotcha Day, Deli!!!!!!! Happy Gotcha Day, Delilah. Looks like you're having fun with the "scratching post." Deli, our dear beautiful friend, Happy Gotcha Day!!! We're so happy you got gotcha'd and found the wonderful furever home that you have now. Thanks for inviting us to your party, we've got more treats and catnip with us to share! Love your incline scratcher, ours have toys in them too but we hardly ever play with it like you did...we just scratch the heck out of the cardboard and make a big mess for The Mommy to clean up. MOL And congrats on winning that contest! Oh, and Bugsy's posted another update today, he's doing fine and adjusting to his cone. Whoops, we see you've already been by and seen that! :) Well, thanks for stopping by and lifting his spirits on Friday and today, dear friends!! You are a lovely kitty and in a wonderful home!! Happy Gotchaversary, Delilah! We always enjoy donating to a cat cause, too. It's a Real Good Thing! happy Gotcha day!! u is so luverly n lucky to havs a goods home! Happy Gotcha Day, Delilah! I'm glad you were gotted. Happy Gotcha Day Delilah! It's so wonderful that you and your mommy found each other 3 years ago today! We know you have a very loving home and it's so wonderful that you are going to donate your allowance to help other kitties that are waiting for their furever home! It was fun watching you play with the ball in the scratcher! You are just so pretty and it's fun seeing you in action! And we always like to see your handsome brofur! Congratulations on winning the contest too! I'm glad you 'got' too--and I know your Mommy is too! And Samson doesn't look lazy--just making sure all is well! Happy Gotcha Day Delilah and concats on winning the fishie flakes. We had to laugh at Samson sitting on the scratcher. Happy Gotcha Day Delilah! Man, yoo were giffing dat ball kwite da workout! Delilah :) Happy, happy, Gotcha Day!! There's nothing better than a safe loving home. You'll have many more celebrations to come. Good for you. Happy Gotcha Day, Deli! We are very glad you and your mom found each other. And we love what Samson got for you - that scratcher looks great! I like how you bof use da scratcher. My gotcha day is da happiest day of my 9 lifes, an Nina's gotcha day is my 2nd happiest day. Purrs to you bof on dis speshul day! Happy Gotcha Day! We will purr for all of those kitties in the world who are still waiting for their gotcha day! Wishing you the happiest Gotcha Day ever. I am glad that your mom was the one who Gotcha! You are very lucky where you are! I was alone too outside before my family took me in. That ball in the scratching post looks fun! Happiest Gotcha Day! I'm so glad I found you cats. I love being your friend Deli! Headbutts and licks on your special day. Happy Gotcha Day, Delilah! Isn't the CB wonderful! Happy Gotcha Day sweet Delilah! Sound like we had a great celebration today. Congratulations on winning the contest! Nanny is trying to teach me how to use the scratcher too. are one super lovely Tortiecat! ♥♥♥ Three hearts for three years! Happiest Gotcha Day, Delilah! Those days are almost more impawtant than birthdays! Chilli says thank you for your concatulations. That ball would drive me nuts, I want to bat it too!!! Happy Gotchya Day Deli!!! Hope you got lotsa really kewl stuff!! !